Gramma’s backyard is on the small-to-average size as far as suburban American backyards go, but it boasts a small garden and a nice, big apple tree. 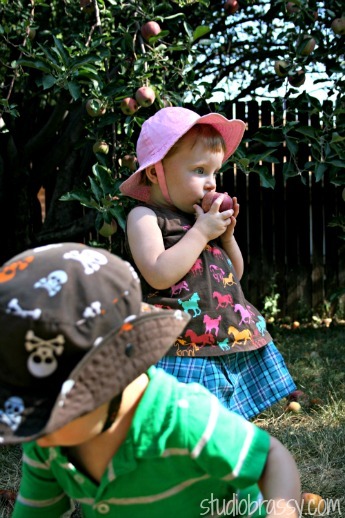 Before Pixie’s first surgery in September, we had an apple picking party, which really just means all the grandkids were thrown together in the backyard and big people helped them pick apples. Or, if your name is Chappy, you try to find the most rotten apples on the ground to eat and cry every time your mother takes them away. Then you can follow that up with being down-right offended at the perfectly good, washed apples she tries to give you instead. Sometimes life isn’t fair, Chappy, and you may as well learn this fact now. We had to share the harvest with birds and worms and bugs, and quite a few apples had already fallen to the ground and gotten gross, so there was a lot of said grabbing of mushy, fermenting apples from Chappy’s mouth. We had a bucket of water so the kids could clean the apples after picking, then one of the adults would cut out any suspicious spots and remove the cores. I was pretty exhausted by the end of the excitement, but the kids all had a good time and we came home with a huge bag of freshly picked apples and some photos. I took several of both my kids and two of their cousins together, but Pixie had her finger in her nose for every single one. In ten years, I expect a huge thank you from her for not making those into this year’s Christmas card.